I’ll be releasing this graphic on stage tomorrow at LeWeb conference in Paris, on a session called 2015: The Year of the Crowd. Health & Wellness: For example, Helparound.co enables P2P diabetes care, including sharing of insulin and pumps. Logistics: For example, Postmates enables the final mile of delivery, and Roost enables P2P home storage. Corporate: Now corporations can have their own Uber-like experience with LocalMotion or build their own Airbnb with Near-me. Utilities: Power sharing with Vandebron, crowdfunded solar with Solar Mosaic, and WiFi sharing with Fon. Municipal: Cities are sharing street cleaning vehicles on Munirent, and public bike systems are heavily funded with Velib. Learning: Numerous startups enable students to share books on Chegg, as well as online training led by instructors and peers. It’s worth noting that in the newer hex areas, they are often fewer logos as the market is young –in the more central hex areas, we had to remove logos due to excessive market crowding –a sign of market saturation in one area. I expect to see new hex areas in data, analytics, and a variety of new startups that offer help to providers such as insurance, financial services, benefits and more. For transparency, these startups reflect those that were recommended by our members, industry experts, or which have received notable funding in the recent months. You can learn more about the funding, on this massive funding spreadsheet which has over 530 rows of funded startups, totaling over $7 billion in funding. 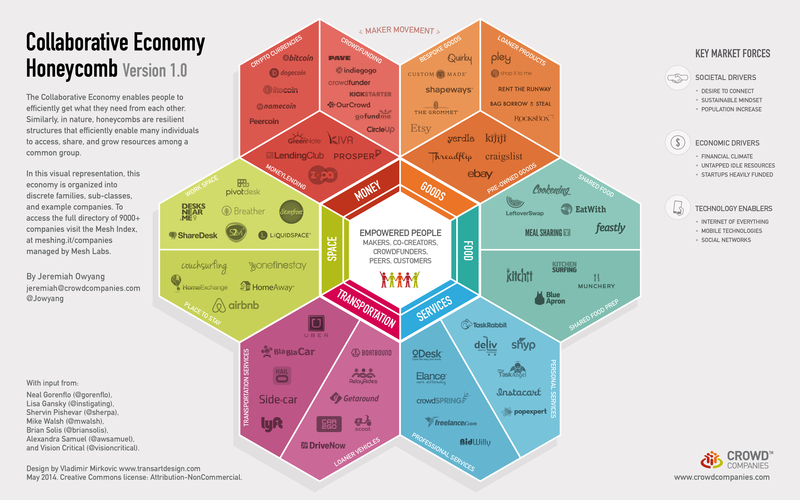 The startups selected in this honeycomb have a Western market focus. You can create your own blank version of the Honeycomb for your own for your personal, business, or regional use, embedded below. We received input from our own Crowd Companies members and industry experts, and drew inspiration from folks like Brian Solis, who guided on the first iteration. To see a massive directory of over 9,000 startups in this market, please advance to the Mesh Directory managed by industry leader Lisa Gansky. Additional input from: Lisa Gansky (@instigating), Neal Gorenflo (@gorenflo), Shervin Pishevar (@sherpa), Mike Walsh (@mwalsh), Brian Solis (@briansolis), Alexandra Samuel (@awsamuel), Bill Johnston (@billjohnston), Angus Nelson (@angusnelson), Augie Ray (@augieray), Jeff Rodman (@jeffreyrodman), John Sheldon (@jsheldonus), Jamie Sandford (@jsandford), Arun Sundararajan (@digitalarun), Jonathan Wichmann (@jonathanwich) and Vision Critical (@visioncritical). and special thanks to Vlad Mirkovic of Transart Design. 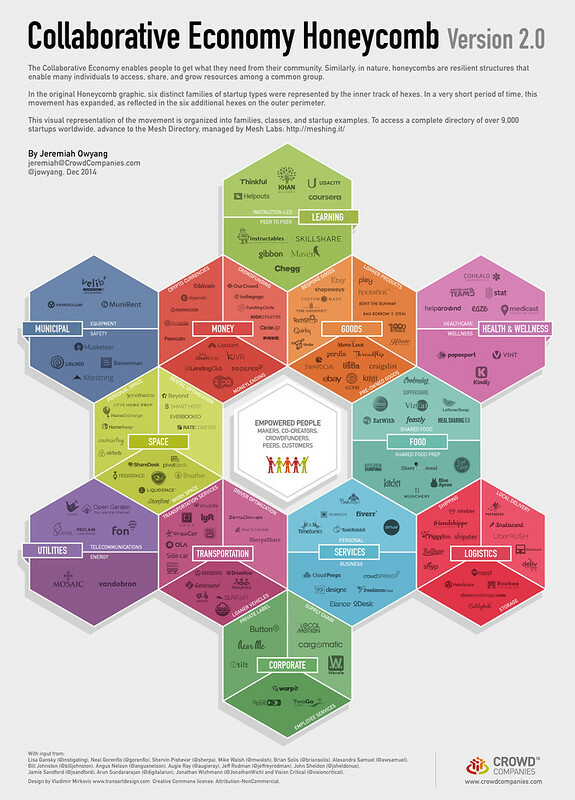 Below, you can access direct URLs to each of the startups listed in the Honeycomb graphic, except for the cryptocurrencies which are decentralized resources. Again, this is just an example list of the 9,000 startups in this ever-expanding, heavily funded startup space. Below: Each region, business, and personal usage will vary. In the spirit of openness and collaboration, we offer this blank template below (or access various sizes) for you to customize for your needs.